I made it. I tested it(CLShortFuse-XDA). It works. You can download SuperOneClick from links above. You can get superoneclick download mirror for windows,(RAR password = "superoneclickdownload.com" ) SuperOneClick Linux or download SuperOneClick OS X. Read This before Rooting your Android device! Make sure you DO NOT mount your SD card. If you still can't get something to run, try doing it in recovery mode. Go to --> Phone Settings > Applications > Development > Enable USB Debugging mode. Please check that your Android mobile is connected to your PC using USB. Remove the Memory Card before Rooting your mobile. 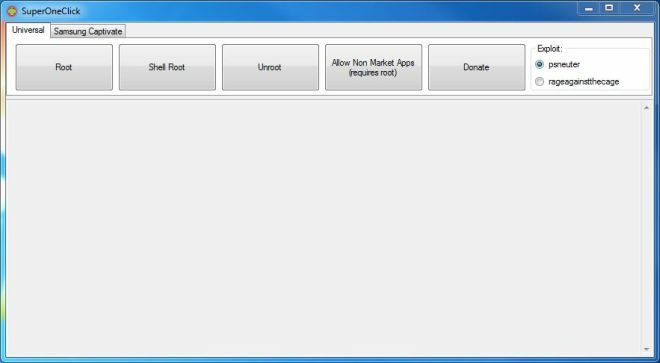 Execute OneClick root and click on the Root button. Wait till the application succeeds in Rooting your Android mobile. After Success message, you will be able to see Superuser. With This video tutorial you can get simple idea about rooting android smartphone with SuperOneClick and why we call it as One Click Rooting with SuperOneClick.Please Keep in touch with SuperOneClick download to grab the latest updates about rooting Android device. Root your Samsung device, go through with our Samsung Odin download site or Check the oneclick rooting ,vroot download site. superoneclickdownload.com not endorsed by Google/Android OS/XDA / shortfuse.org site or any other reputed trade names in the industry. As same as we don't representate xda-developers/shortfuse.org officially. also XDA/shortfuse.org/our this site is in no way responsible for the damages or any other thing.Use This on your OWN RISK.